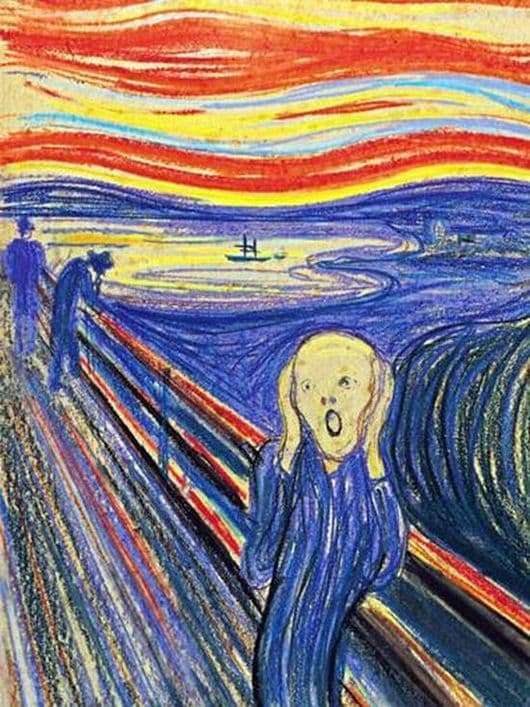 The painting depicts a human figure screaming in despair. The man is depicted against the sky, which is blood-scarlet. Also present a generalized landscape background. The artist has written a series of paintings Creek. The work served as a kind of prelude to the art of the twentieth century. These canvases foreshadowed the spread of modernism, opening the themes of despair, alienation and loneliness. It seems that the master was able to foresee the future. Soon the picture became a reality when world wars, famine, revolution and environmental disasters broke out. And the cry of the soul shows that all this is inevitable and not surmountable. What inspired Munch to create such a masterpiece? He himself answers this question. In his diary some records were found that lead to certain conclusions. Munch wrote that once he and his friends were walking along the path. It was getting dark and the sun was already setting behind the clouds. Here, unexpectedly, for no reason, the sky turned a scarlet color to blood. Munch stopped, he felt very exhausted. He began to lean on the fence, but continued to monitor the blood in the city sky. For some reason, Munch’s friends went on in complete peace of mind. The artist himself stood in amazement, feeling the strongest excitement. Munch also describes that he felt a boundless cry, which pierced through nature. Some believe that the master saw the mummy and it is it that displayed on the canvas. Others believe that Munch was mentally ill, he had a mental disorder. And Munch painted pictures of the cry, as if in the hope of getting rid of the cry of his own soul. So, the screaming figure looks like a skeleton, or an embryo, or a sperm cell. Such associations she causes many. The lines of the landscape are undulating, as if showing an echo, as if a cry were heard from all sides. Emotions of the model are extremely negative. And it seems that, picking up the scope of the universal scale, the subject subjugates to himself the whole environment.